Thank you, Chairmen DeSantis and Jordan and Ranking Members Lynch and Cartwright, for the opportunity to testify. There can be no doubt that immigration enforcement is in a state of collapse. Border apprehensions, which are considered an indicator of illegal crossing attempts, are rising and many of the illegal crossers are being released into the country instead of repatriated. Hundreds of thousands of temporary visitors are overstaying their visas each year. Department of Homeland Security (DHS) statistics show clearly that over the last several years the number of deportations has plummeted and the number of illegal aliens allowed to stay and work in the United States has increased. The vast majority of illegal aliens residing in the interior face no threat of deportation, regardless of when or how they arrived, or if they have been deported before. Many deportable aliens who are encountered and apprehended by Immigration and Customs Enforcement (ICE) officers are released soon after, even if they have come to ICE's attention after being arrested by local authorities. This state of affairs can be traced directly to policy changes put in place by the Obama administration. While administration officials claims that these policies are "smarter and more effective" and allow the agencies to better focus on aliens who represent a threat to the public, in reality the intent, and certainly the result, has been the dismantlement of effective enforcement. It is no exaggeration to say that DHS is running a massive catch and release program. These downward trends are due to two types of policy changes: first, a so-called "prioritization" scheme that shields from enforcement all but the most egregious criminals and immigration violators, and second, the abandonment of important tools that enable ICE officers, agents, and attorneys to do their jobs in an efficient and cost-effective manner. Among the tools that have been abandoned by the agencies: 1) detainers, which enable ICE officers to take custody of aliens who have been arrested by local law enforcement agencies; 2) accelerated forms of due process that avoid the need for long, drawn-out proceedings in the clogged immigration courts; and 3) partnerships with local law enforcement agencies to identify and remove criminal aliens in jurisdictions where ICE cannot cover its workload. The drop in enforcement activity has become particularly acute since President Obama's controversial executive actions were announced on November 20, 2014. These included two new policy memoranda spelling out new restrictions on immigration enforcement, with the effect that only narrow classes of illegal aliens — primarily those convicted of the most serious crimes and new arrivals who lack family or community ties in the United States — would be subject to arrest, questioning, detention, or immigration charges and that any immigration infractions in prior years, such as apprehensions, deportations, or skipping a court date, would be ignored. These policies impose enormous costs on American communities — not just the distorted labor markets and higher tax bills for social welfare benefits that result from uncontrolled illegal immigration, but more specifically, a real and present threat to public safety from criminal aliens that ICE officers are told to release instead of detain and remove. ICE's mandated over-focus on processing only the "worst of the worst" criminal aliens means that too many of "the worst" deportable criminal aliens are still at large in our communities. One of the most urgent tasks now before Congress is to restore integrity to our immigration laws by ending this massive catch and release scheme that wastes government resources and endangers the public. Enforcement at the Border. Since 2011, the number of illegal crossers apprehended by the Border Patrol has increased by 43 percent, from 340,000 to 487,000.1 It is generally believed that border apprehensions are an indicator of the number of attempted illegal border crossings, and that approximately half of those who attempt illegal entry are successful. U.S. Customs and Border Protection (CBP) states that "The uptick is largely due to the increase in unaccompanied children and family units who turned themselves in to Border Patrol agents in South Texas this summer." These cases totaled 137,000 in 2014 alone. The apprehension statistics are concerning enough, but they do not tell the whole story. DHS has yet to fully disclose how all these cases have been handled — that is, how many of those apprehended were removed or returned, and how many were released into the United States? Of those released, how many have concluded their immigration proceedings or absconded from those proceedings? ICE officers have told me that since the administration's policies of prosecutorial discretion were expanded, they are allowed to process only a small fraction of the number of aliens that they used to handle. One recently told me that his office used to process as many as 100 aliens per day, but since the president's executive actions went into effect, now they are processing fewer than five to 10 aliens per day, with the same staff and budget — meaning the government is spending perhaps 20 times more in resources to deport each alien than was the case before. This reality suggests that the president's executive actions were less about prioritizing cases to make best use of scarce resources and more about protecting illegal aliens. As of mid-January 2015, there were 167,527 convicted criminal aliens on ICE's docket who had received final orders of removal, but who had not departed and were at large in the United States after release by ICE. Further, ICE gang investigators have expressed concerns to me that gang members they arrest (usually after conviction on state charges) and turn over to Enforcement and Removal Operations (ERO) for detention and removal processing are sometimes de-prioritized and released — and even allowed to apply for work permits — which can unravel their prosecution and removal case, not to mention threaten public safety. ICE officers also report that informants who once agreed to work for ICE to help dismantle major gang conspiracies in exchange for the ability to stay here now are telling ICE that they have no incentive to do so because they qualify for the president's amnesty or know that they can take advantage of "prosecutorial discretion" policies. One gang investigator told me that some illegal alien gang members actually taunt ICE agents, knowing they are now virtually untouchable for deportation. Detention Space. The administration maintains that it cannot possibly detain and remove all of the estimated one million deportable aliens who are arrested each year, due to a lack of personnel and resources. Congress provides ICE with funding for (and a mandate to fill) 34,000 detention beds. But according to ICE records, the agency has not complied with this mandate since FY2012. The average daily population (ADP) has declined every year since then. 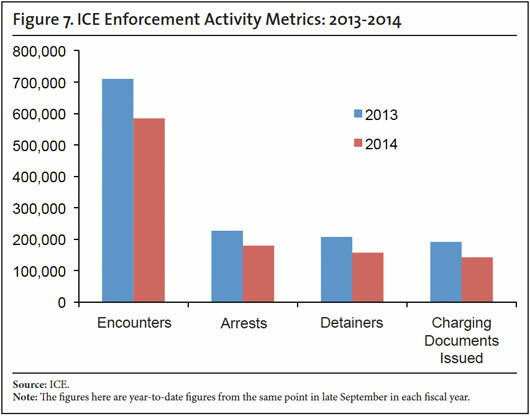 ICE reports an ADP of 33,788 for FY2013, an ADP of 33,227 for FY2014, and an ADP of 27,119 so far in FY2015. As of one month ago, ICE reported that the ADP was 25,480. This is the lowest level since FY2006, when the bed mandate was 20,800 per year. 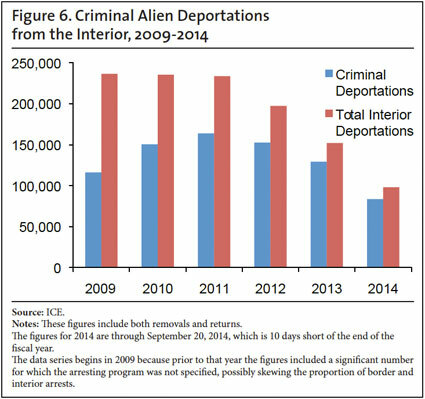 Clearly the criminal alien releases and decline in deportations cannot be blamed on a lack of detention capacity. On the contrary, one significant problem appears to be unwillingness to use the detention capacity that Congress has provided. A number of ICE's local law enforcement partners have reported noticeable drops in the number of illegal aliens that ICE will take into custody after arrest and incarceration in their jails. Several sheriffs have told me that the number of beds that ICE has contracted with them to fill has shrunk considerably, and the number of illegal aliens they have to release back into the community has grown. For example, Sheriff Tom Hodgson of Bristol County, Mass., says that just a couple of years ago his jail held an ADP of more than 200 aliens for ICE, but it has now shrunk to about 80 ADP. Just a few weeks ago, Sheriff Paul Babeu of Pinal County, Ariz., testified to the House Judiciary Committee that ICE is releasing 30-50 illegal aliens every day from ICE detention facilities in his area, and that these aliens would have been deported but for the new policy changes outlined in the president's November 20 executive actions. On one day in February 2013, ICE released 207 illegal aliens from the Eloy detention facility in Arizona into his county. Of these, 48 had been charged or convicted of manslaughter, child molestation, aggravated assault, weapons, or drug crimes. To this day DHS has refused to provide him with the names, criminal histories, or security threats of these criminals. The Non-Departed. Allowing so many deportable aliens, especially criminal aliens, to remain at large in our communities means that what little effort the government makes to deport them ultimately is not successful or enforced. This leads to the absurd situation we have today, where the number of aliens who have received a final order of removal, but who are still in the United States, has risen to nearly 900,000 as of September 2014.14 This number grew by 40,000 in the last two years. Part of the reason is that, even with the administration's mass dismissals of "non-priority" cases in lieu of immigration hearings, many of the aliens whose cases are completed and who are ordered removed simply do not comply if they are not detained. They were never a priority for enforcement under this administration, but the president's recent executive action specifically nullified all removal orders and enforcement actions involving "non-criminals" taken before January 1, 2014. Career Personnel Blow the Whistle on Policy Changes. Numerous career immigration officers working in different parts of the agency, at all ranks and in various parts of the country have expressed to me their dismay and frustration with the Obama administration's calculated unraveling of enforcement, which they consider to be an abdication of their agencies' mission and responsibilities to the public. "It was almost a perfect system," one ICE officer told me recently, in describing the combination of Secure Communities, 287(g), and fugitive operations teams that had been in place in his area of responsibility from about 2009 to 2011. "Almost no illegal aliens went through the jails here without us knowing about them. It was a rare case when we did not issue a detainer, such as a LPR [lawful permanent resident] or someone we could not identify. And when they were caught, they asked to go home. The word was out in the community, ICE is out there, and they'll find you. Now, people are laughing at us [ICE]; the illegal aliens know all they have to say is, 'I have kids,' or 'You can't arrest me because Obama changed the law'. … And now local police keep us at arm's length, because they either don't understand what we do, or are afraid of being sued, and our own agency contributes to it." Abandonment of Critical Enforcement Tools. In addition to declaring significant categories of illegal aliens who once would have been classified as an enforcement priority to be off-limits, the Obama administration has abandoned certain critical tools that gave immigration enforcement officers the ability to carry out their mission efficiently. Detainers. Most significant of these with respect to criminal aliens is the use of detainers. Detainers are a perfectly legitimate, lawful tool to help ICE take custody of aliens from local authorities. They help protect the public and ICE officers by enabling enforcement to take place in a secure setting rather than on the street, in homes, or at work places. The administration is pretending that it abandoned this tool because of unfavorable court rulings, but after years of whittling away at their use, in fact top agency leaders helped instigate these rulings by changing certain long-held positions (over the objections of career personnel and without legal foundation). The new policies were then simply accepted by certain judges — leaving ICE's local law enforcement partners who had cooperated in good faith (and in compliance with federal regulations) twisting in the wind and subject to significant legal and financial liability.16 The final nail in the coffin came in the November 20 executive actions, which included a provision prohibiting ICE officers from issuing detainers in all but rare cases. Legal Action. One factor behind the erosion of enforcement has been a steady stream of predatory law suits aimed at obstructing ICE from doing its job. The administration has contributed to the success of these lawsuits by declining to challenge them; conceding in settlements; withholding assistance from local enforcement partners; and issuing controversial policy statements, sometimes without sound legal foundation, that can be used by plaintiffs hostile to the government's mission. If one were to think of immigration litigation against the government and its enforcement partners as a game, then the Obama administration is throwing it. One recent example is the Lopez-Venegas v Johnson lawsuit brought by the Southern California chapters of the ACLU, targeting the ICE and Border Patrol practice of offering the option of voluntary return in lieu of lengthy deportation hearings. DHS agreed to a settlement of the case, with the result that now officers in the San Diego Border Patrol Sector and Los Angeles ICE Field Office (both areas with huge caseloads) must operate under cumbersome procedures that encourage Mexican illegal aliens to opt for immigration court hearings that can take up to seven years instead of allowing them to encourage illegal aliens to agree to swift deportation with minimal consequences. This settlement will further bog down ICE and Border Patrol officers and the already dysfunctional immigration courts while giving illegal aliens permission to live and work here in de facto lawful status for many years. 287(g) Programs. The administration has reduced the number of local law enforcement agencies that can volunteer to assist with immigration enforcement by canceling dozens of these effective delegation of authority programs, refusing to approve new ones, and assisting in lawsuits against some of its former partners. The result is that more criminal aliens fall between the cracks and are able to evade deportation, and ICE field offices lose out on the opportunity to have local officers do ICE work at almost no cost to the federal government. Dominic Durden, a 30-year old Riverside County, Calif., sheriff's dispatcher, was killed on July 12, 2012, by illegal alien Juan Z. Tzun, who crashed into him while making an illegal left turn hurrying to a day labor site. Tzun was driving without a license and had two prior drunk driving convictions, which had not triggered ICE action. On April 3, 2013, Tzun was sentenced and served 30 days in jail before he was set free on a work release program. Eventually ICE took him into custody and Tzun was deported to his native Guatemala on March 20, 2014. Katerin Gomez, age 35 and mother of three children under age 13, was killed in Chelsea, Mass., on October 18, 2014, by a stray bullet through her window. The gun was fired during a street brawl allegedly by Hector Ramires, a 21-year-old illegal alien member of the notoriously violent MS-13 gang, who was at large awaiting trial for two prior arrests for armed robbery (one with a gun, one with a knife), in which his illegal status and gang membership were noted. The police report also includes mention of prior criminal involvement in his home country of Honduras. ICE did not issue a detainer or initiate deportation proceedings after either prior arrest, nor did it make an effort to charge Ramires as an illegal alien in possession of a firearm, which is a felony punishable by up to 10 years in prison. Magno Sosa, age 32, was shot twice in the head and killed on January 17, 2015, in Everett, Mass. The accused is Rigoberto Escobar, an illegal alien who was out on pretrial probation for assault and battery with a dangerous weapon and assault and battery on a police officer. Again, ICE declined to issue a detainer or pursue immigration charges after the assault and battery arrests, most likely because of policies forbidding officers from initiating charges on illegal aliens who have not yet been convicted. Ismael Mejia, age 26, and Luariano M. Ramirez, age 19, were killed on June 20, 2013, in Muscoy, Calif., after being struck by illegal alien drunk driver Felix Roman Nava. About one year prior to this fatal incident, Nava had been in ICE custody after a prior DUI conviction, but was released on bond to await proceedings. In August,2013 he was convicted of two counts of Gross Vehicular Manslaughter While Intoxicated and sentenced to six years in prison. Senior ICE officials have told me that they estimate that about 50 percent of arrested aliens freed from ICE custody or freed by local law enforcement agencies in defiance of detainers have re-offended after release. Restrict DHS appropriations so that no funds may be used to implement any executive actions or policy directives that prevent enforcement officers from performing their jobs and/or allow large classes of illegal aliens to avoid deportation and receive work permits. Authorize and direct the Border Patrol to keep illegal border crossers in custody in the immediate border region, and that the only form of due process available shall be Expedited Removal. Clarify the authority and imperative for the transfer of aliens from local to federal custody for enforcement. Impose sanctions on local governments that obstruct the process. Provide funding for an increase in detention capacity for immigration enforcement agencies, and require that DHS use it for that purpose. Clarify ICE's authority to use accelerated forms of due process, especially for recent border-crossers and criminal aliens, in order to relieve pressure on the immigration courts. Restore funding and flexibility to programs such as 287(g) that enhance ICE deportation capacity and address local public safety needs. Mandate the next step toward implementation of a biometric entry-exit tracking system, whether implementation of biometric exit and air and sea, or implementation of biometric entry data collection from all non-citizen land arrivals. Withhold approval for any relaxation in visa issuance procedures, interview requirements, or visa waiver program expansion until anti-fraud programs are enhanced and the annual number of new overstays is reduced by 50 percent. Clarify the categories of aliens who may be issued work permits, and examine the merits of a bar on issuing work permits to aliens in deportation proceedings. John F. Simanski, "Immigration Enforcement Actions: 2013", Department of Homeland Security, and the "CBP Border Security Report, Fiscal Year 2014," published by U.S. Customs and Border Protection. 2 DHS Secretary Jeh Johnson, quoted in the Washington Post, February 17, 2014. 3 Testimony of Jessica M. Vaughan, House immigration subcommittee, December 10, 2014. 4 ICE statistics on Unaccompanied Alien Children booked into ICE custody, obtained by the author. 5 DHS Office of Immigration Statistics. 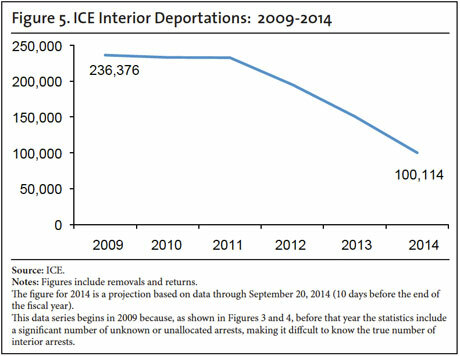 6 Jessica M. Vaughan, "ICE Enforcement Collapses Further in 2014", Center for Immigration Studies, October 2014. 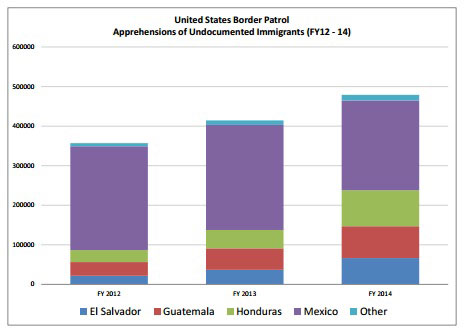 8Jessica M. Vaughan, "ICE Document Details 36,007 Criminal Alien Releases in 2013", Center for Immigration Studies, May 2014. 9 DHS records provided to Sen. Chuck Grassley, released on January 30, 2015. 0 Testimony of DHS Secretary Jeh Johnson before the House Homeland Security Committee on December 2, 2014. 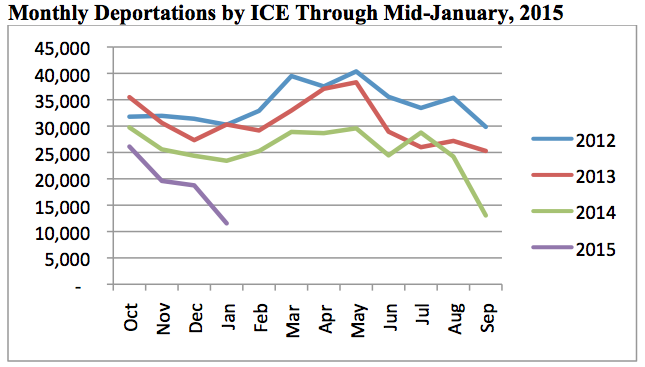 1 ICE Weekly Departures and Detention Report, January 26, 2015. 2 Office of the Inspector General, "U.S. Immigration and Customs Enforcment's Alternatives to Detention (Revised)," February 4, 2015, OIG-15-22. 3 Source: ICE records obtained by the author through a FOIA request. 4 ICE WRD, op. cit. 5 See complaint of Patricia Vroom. 6 See Dan Cadman and Mark H. Metcalf, Disabling Detainers: How the Obama Administration Has Trashed a Key Immigration Enforcement Tool", Center for Immigration Studies, January 2015. 7 Devlin Barrett, "U.S. Delays Thousands of Immigration Hearings By Nearly Five Years", Wall St. Journal, January 28, 2015. 8 Jessica M. Vaughan, "Government Data Reveal 7.4 Million Work Permits Issued Since 2009", Center for Immigration Studies, February 2015. 9 Congressional Research Service, "Analysis of Data Regarding Certain Individuals Identified Through Secure Communities", July 27, 2012.